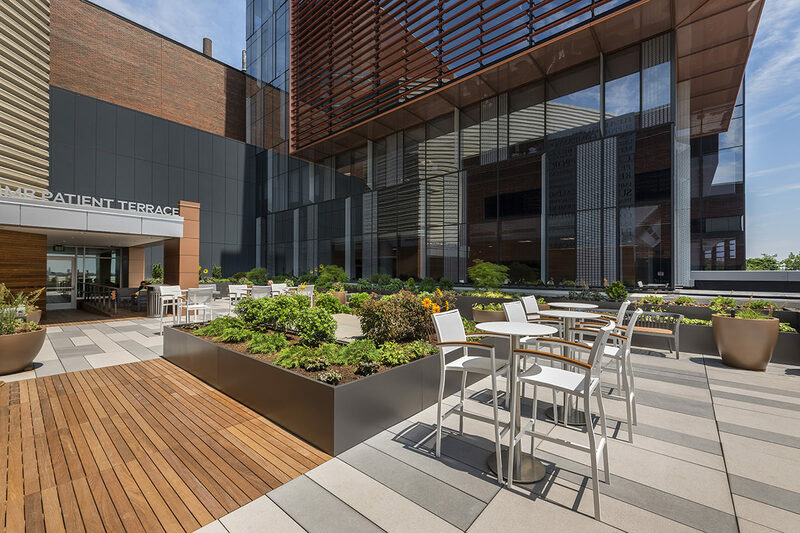 The New York State Chapter of the American Institute of Architects (AIA) has recognized TWMLA’s work on the recently completed MMMB Patient Terrace at Roswell Park Cancer Institute in Buffalo, New York. The project has received both a 2018 AIA Merit Design Award as well as a Gold Medal from the Healthcare Design trade organization. TWMLA played a leadership role in the development of technical green roof systems resulting in an artfully crafted garden that was at the core of the client’s vision for a rooftop respite for patients and their families. TWMLA worked closely with the project architects to develop the materials and amenities palette that define a comfortable and memorable space.